We are a local and long distance moving company. We specialize in servicing long distance moves nationwide. Locally we service the Greater Cleveland area. Bright Eyed Moving provides you with relocation specialists that are not only great people, but also highly skilled movers. You will feel comfortable throughout the entire moving process with our representatives taking an abundance of care with your household items. We uphold high standards of customer service for each and every person we employ. From your inbound call representative to the movers who will be taking care of you and your belongings on moving day, you can rest assured, your satisfaction is at the very top our priority list. We complete your move seamlessly with smiles on our faces. BEM thrives on teamwork. The goal of our team is to achieve maximum success in every aspect of work and life – And it all starts with successfully conducting YOUR MOVE. We are the team you want on your side on your move day. We are a team who truly believes in the power of working together. We promote an ideology within the company which educates our employees not only on how to become better at their job EVERY day, but also to become a better person EVERY day. This mentality of constant self-improvement ensures that what you are getting with our company is nothing short of the most honest, prideful, and high quality service in the industry. This is the staff you want handling your belongings and working in your home! 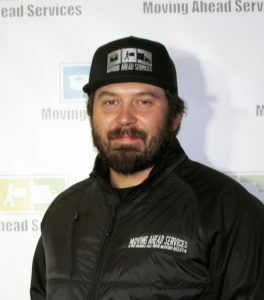 Jeff Collins is the president and CEO of Bright Eyed Moving. Jeff is a Veteran of the United States Marines and got his start in the relocation industry in 2004. 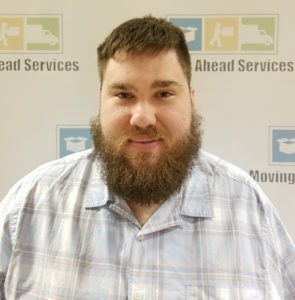 Jeff is a Northeast Ohio native and plays a very active role in the business, working with customers and our team to ensure we provide the very best relocation solutions. 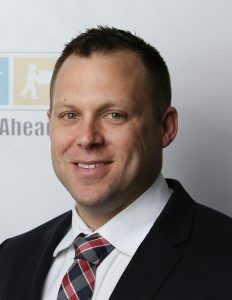 Adam Gurwell is the regional manager, overseeing Bright Eyed Moving in Cleveland as well as our affiliates in Willoughby, Cincinnati, Columbus and Pittsburgh. 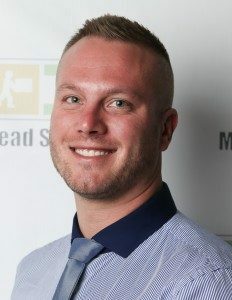 Adam began his career in the relocation industry where many do, in the back of a moving truck! His insight and experience provide the very best in management and business strategy. Taylor Hope is the dispatch manager for Bright Eyed Moving and affiliates in Northeast Ohio, Cincinnati, Columbus and Pittsburgh. Taylor coordinates team scheduling and customer moves to ensure a seamless moving day for all! 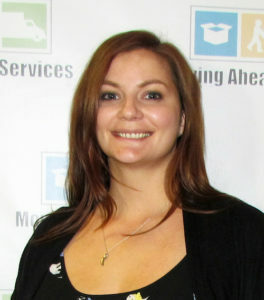 Taylor started at Moving Ahead Services in the field and brings valuable experience to the team. Amanda Warder is the manager of business administration for all HR, payroll and administrative tasks as it relates to Bright Eyed Moving and affiliate locations. Amanda works with customers and our team for everything related to billing, customer storage and more. Rich Greenwalt is the warehouse manager at Bright Eyed Moving. Rich aides in organizing and order all necessary supplies and ensuring all equipment is available and operating in tip top shape. Dominic Delciappo assists all current, potential and past customers via phone, email, text and more. 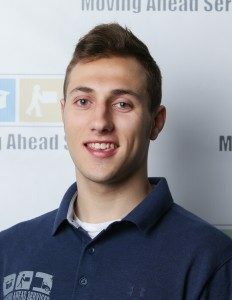 Dominic provides all relevant information to plan and schedule a move for a seamless moving day. 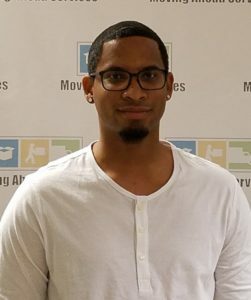 Josh Gantt assists all customers in planning and scheduling moving services, helps potential customers and communicates seamlessly via email, chat, text and calls. Bright Eyed Moving is a locally based Cleveland, Ohio, moving company. We pride ourselves on being part of our community and providing outstanding customer service on every job. One of the ways we set ourselves apart from our competition is through the wide assortment of services we provide. Whether you’re moving locally from one street to another, nationally into another state, or you only require partial moving services, supplies, storage, or crating, we are here for you. Our professional and experienced movers are not only skilled in the art of packing, loading and furniture arranging, they’re also experienced in assessing and advising on relocation. Working one on one with a relocation specialist can save you time and money in your packing and moving process and help you get all your valuables to your next destination safely. Possibly the most common type of move we accommodate is moving homes. This can be stressful business if you’re not organized and have all the proper supplies in place. Bright Eyed Moving takes that stress from our clients and turns it into moving success, focusing our energy on safely packing and loading your valuables so that you can focus on children, pets, and your carryon bag. Moving to a new house should be an exciting endeavor and Bright Eyed Moving wants to keep it that way. We are with you from the beginning, helping with planning, organizing, wrapping, packing, loading and transport, and we’ll stay with you until the very end through unloading, unpacking, and rearranging the furniture. Another type of moving call we receive is from local businesses who are upgrading, downsizing, or simply moving to a new location. Moving an office is very different than moving a house in that there is an assortment of expensive electronics to move and private documents to transport. Bright Eyed Moving takes office moves very seriously, careful to maintain the privacy of your stored information and documents and seeing that your valuable supplies are all delivered on time and in one piece to your new location. Office moves cost businesses time and money and take time away from clients and business needs. Bright Eyed Moving understands that a business needs to be fully functional to make money, which is why we act quickly and cautiously to organize and transport your office from one space to another with minimal time wasted. BEM is full of team players, we recognize that everybody is an important asset to our team with no big or small roles to fill. From answering phones to driving the trucks, each of our team members is valued and recognizes the importance of their role in the moving process. Because of this, our clients get the best from every employee they encounter. You can rest assured that you and your family will be greeted with a smile and a genuinely positive experience from start to finish. We educate our staff, not only on best moving policies and procedures, but on self-motivation and improvement as well. We want our team to be the best that they can be on and off the clock. By working together and celebrating everyone’s successes, we have seen major growth and improvement across the board. We want to share this with our customers and show you what it’s like to work with a team of people who want to do their best and bring the best out in your moving experience. Looking for a quote on your next move? Contact us today to learn more about our selection of moving services, the Bright Eyed Moving service area, and how to receive a visit for a moving assessment and question and answer session. Don’t let a big move get the best of you or cause unnecessary stress in your life. Whether you need a full-service move, or you simply want to store some belongings while you get settled in a new house, Bright Eyed Moving is happy to help. Our friendly staff is always happy to hear from new or returning clients, and we’re eager to share stories of our successes with you. Need more confirmation on our moving strategies? Check out our references and reviews online and see for yourself, the difference that a Bright Eyed Moving move can make.